If there’s one thing that I’m totally fine over-buying for Darah, it’s books. We try not to go too bananas on toys for her, but books….let’s just say she has as many as her father and I do, combined! Books are a gateway to lands of adventure and imagination. They are filled with new words, interesting ideas and hilarious scenarios, all waiting to be enjoyed by young ones (and the young at heart!). Reading books with Darah is an absolute joy, and I have every intention of continuing to “spoil” her with reading material. I pray she will continue to enjoy it as much as she does now, and hopefully even more once she is reading on her own. You may think that I don’t have any criteria for purchasing books and that I’ll buy anything and everything. Not so, my friends! I especially look out for work that is visually stunning, teaches lessons that will inspire conversation, and show people (or gendered animals) in roles outside of traditional stereotypes. Today I’m excited to introduce some international children’s publishing houses that have all of these options and more! First up, Lemniscaat. This is a Dutch publishing house that is particularly known for its wordless picture books. Yes, I said wordless. A book doesn’t have to writing in it in order to get your imagination going! Our top pick: The Yellow Balloon. In this work, you watch a yellow balloon float all over the world, getting a bird’s (er, balloon’s) eye view of our gorgeous planet and its inhabitants. You will definitely see some interesting things on this adventure. When we read this wordless books, we spend 10-15 minutes with it, easily! Next, we have Floris Books. This publishing company is from Scotland. They have a wonderful variety of traditional and new-to-you tales that you will love. Our top pick: Goldilocks and the Three Bears. This is Darah’s first copy of this beloved tale, and it is wonderfully told and beautifully illustrated! We also got to review AMMO Books. This might well be my very favorite American publishing house! I’ve reviewed some of their books before (check out my review here) and I was every bit as impressed with what I saw from them this time around. We checked out this imaginary castle giant floor puzzle, and it was simply stunning. I can’t wait to put this puzzle together again and again with Darah over the next few years! It has 24 pieces, so it is appropriate for ages 2 and up. Last, but certainly not least, we checked out some reading material all the way from New Zealand. Gecko Press is the publishing house, and it is FABULOUS!!! Their tagline is, “curiously good books,” and I’d say that’s exactly right. These books draw you in from cover to cover with funny, quirky tales that will make you laugh and also make you think. Our top pick: Odd Bird Out. This is about a raven who just doesn’t fit in with the typical flock. He loves to sing and to dress in colorful clothes. He eventually has to leave his home town because he isn’t accepted there. But the bird finds his bliss and his acceptance later in the story. I won’t spoil the end for you, but I will say that this book totally blew my mind with how many thought-provoking topics it uncovered and how many really good conversations it is going to inspire in my house about being different and why it is important to celebrate our differences, rather than try to hide them. This might actually be my favorite book of all the books we reviewed, and that’s really saying something, because we were sent MANY treasures! Win it! : I want you to have overflowing bookshelves in your home, so one lucky Stuff Parents Need reader is going to win an assortment of books from Gecko Press! AWESOME!!!! Darah’s Favorite Musician Writes Children’s Books! Caspar Babypants Review and GIVEAWAY!!! I’ve told you before that even though Darah might have one of the greatest collections of children’s music of any kid I know, she still has a favorite artist (how did she choose?! So many great choices!). Her favorite is Caspar Babypants, otherwise known as Chris Ballew from a band we grownups may recall, The Presidents of the United States. She knows MANY of his songs by heart and loves to giggle, sing and dance when we play his music. And now she loves to read his books! Chris and his wife, Kate Endle (an EXTREMELY talented artist) have created two beautifully written and illustrated books for kids. 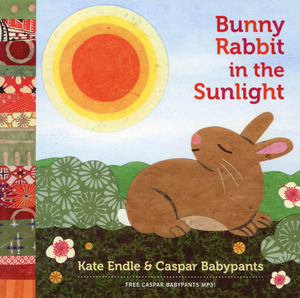 The first one is a board book, called Bunny Rabbit in the Sunlight . Darah loves the cover artwork of the bunny, because he looks just like her beloved bunny. The book has a great tempo to it, and you can imagine it being sung like a song. It’s all about different creatures enjoying all the different types of light (morning light, candle light, twilight, etc.). The pictures are truly gorgeous and we read this frequently. 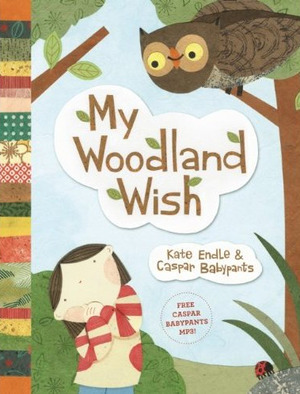 But the book we read every single day is My Woodland Wish . This is a larger picture book, and the art inside is very cool paper collage. It’s all about a kid who is aware of all the wonderful wildlife that exists right outside her back door, and how she longs to get to play with all those creatures. The book even comes with a free MP3 of the book being performed as a song by Casper Babypants. It is absolutely beautiful, and Darah quickly picked up on the fact that there’s a clever ladybug waiting to be found on every page of the book. That is a mission she takes VERY seriously when reading. There’s no doubt that Chris Ballew can write beautiful music. And now I see without a doubt that Kate Endle can draw captivating images. What a magical thing occurs when the two put their talents together for children’s literature. I highly recommend both books to be added to your child’s library! We’re so glad they are part of ours! Win it! : One lucky Stuff Parents Need reader will win your choice of book from Kate and Chris! Woo hoo!